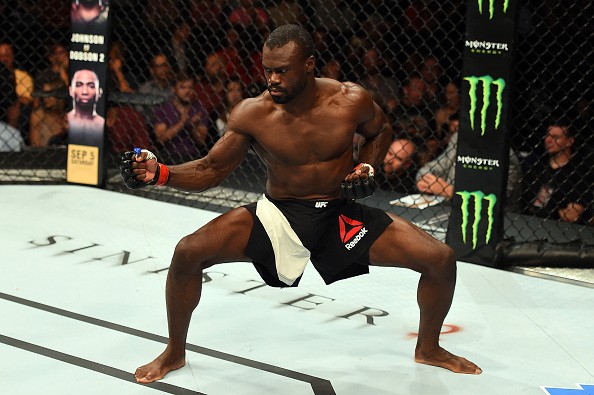 Middleweight Uriah Hall rebounded from a May loss to Rafael Natal Saturday night at Bridgestone Arena in Nashville, Tennessee, stopping late-notice newcomer Oluwale Bamgbose in the first round. Looking comfortable in his first Octagon appearance, New York’s Bamgbose moved smoothly while striking with the former Ultimate Fighter finalist, but after tripping and falling to the mat, Hall was able to pin his foe against the fence and let loose with a series of strikes that prompted referee Herb Dean to halt the bout at the 2:32 mark of the opening round. Hall moves to 12-5 with the win; Bamgbose, who replaced the injured Joe Riggs, falls to 5-1. 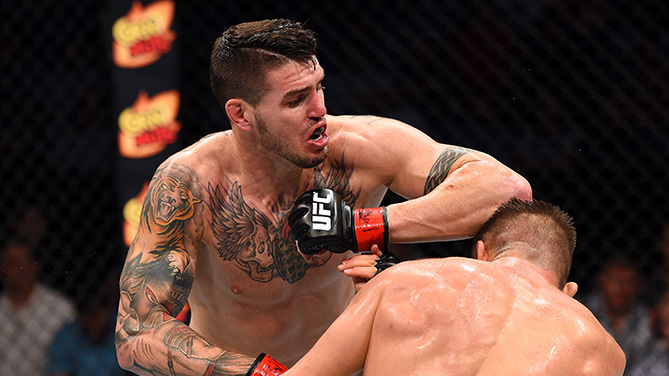 Chris Camozzi broke a five-fight Octagon losing streak in middleweight action, taking a three-round unanimous decision over Tom Watson. Scores were 29-27 twice and 30-26 for Camozzi, now 22-10; Watson falls to 17-9. Camozzi was on target with his strikes from the start, and a Watson takedown attempt even saw the Coloradan nearly sink in a guillotine choke before “Kong” slipped free. Watson kept the pressure on in order to take away the southpaw’s reach advantage, but Camozzi always had an answer, using a leg trip to get the fight to the mat in the final two minutes. Camozzi almost got a rear naked choke, yet Watson got loose again and went on the attack as the two stood. A second low blow from Watson earned the Brit a point deduction in round two, adding a sense of urgency to his attack, and he was able to cut Camozzi under the right eye. An ill-advised takedown attempt with under two minutes left did allow Camozzi to stop the rally though, as another guillotine attempt put his foe on the defensive, even though “Kong” did get the fight to the mat in the closing seconds of the round. Fatigue set in for both combatants in the final frame, and though Watson had some solid success striking, a Camozzi takedown likely wrapped things up for the Lakewood product, who earned his first UFC win since 2013. 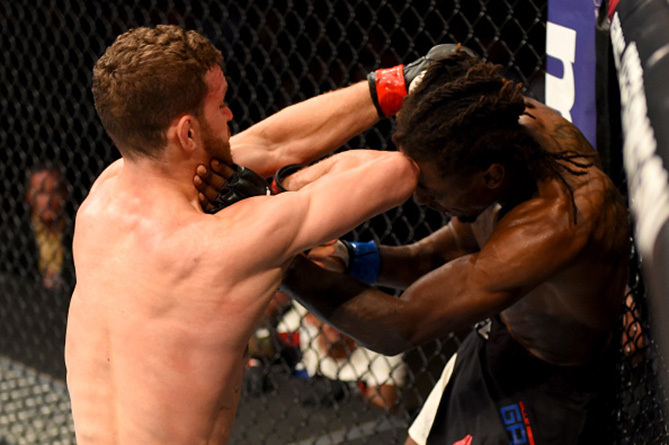 The number 11-ranked flyweight in the world, Franklin, Tennessee’s Dustin Ortiz, delivered an impressive performance in his first fight at home since 2011, halting Willie Gates in the third round. Gates’ jab was sharp as the bout began, but the shorter Ortiz quickly closed the gap and got the bout to the fence and then the mat. Gates got back to his feet and began to use his stick and move strategy again, but Ortiz put him on his back again, this time moving into the mount position, where he kept him to the horn. Ortiz’ mauling style continued to pay off in the second, and though Gates was able to stay upright for much of the round, in the final two minutes, the Tennessee native earned the takedown and went on the attack, with his ground strikes nearly setting up a rear naked choke and an arm triangle as the round closed. The third was more of the same, Ortiz taking the bout to the mat and just unloading on the exhausted Californian, with referee Mario Yamasaki finally calling off the fight at the 2:58 mark. With the win, Ortiz moves to 15-4; Gates, who was a late replacement for the injured Ian McCall, falls to 12-6. Bantamweight contender Frankie Saenz upped his current winning streak to seven, taking a hard-fought three-round split decision over Sirwan Kakai. Scores were 30-27 twice and 28-29 for the 14th-ranked Saenz, now 11-2; Kakai falls to 12-3. The bantamweights got off to a fast start and kept the pace high throughout the opening five minutes, Saenz being the busier striker, but Kakai was just as effective with his more selective output. The Sweden product even threw in a takedown of the former Division I wrestler to add to his point total. Saenz got his first takedown midway through round two, but Kakai jumped right back up, resuming the kickboxing match. A Saenz elbow may have been the most telling blow of the round, but Kakai’s counters kept the Arizonan from getting too ahead of himself. The back-and-forth action continued in round three, with fatigue not keeping the 135-pounders from going at each other like they had in the previous two frames. But Saenz’ high workrate paid off on the scorecards, giving him his third Octagon victory. 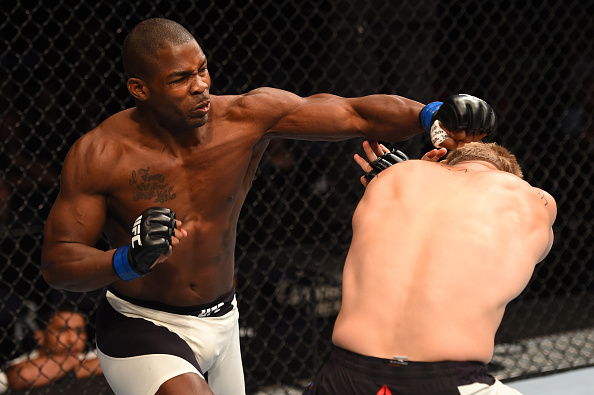 Light heavyweight newcomer Jonathan Wilson had a long wait for his UFC debut to take place, but once he entered the Octagon, he didn’t stick around long, knocking out Chris Dempsey in less than a minute. California’s Wilson (7-0), a stablemate of welterweight standout Lorenz Larkin who was scheduled to debut last December, needed just a single left hand to put Dempsey on the deck, with hammerfists bringing in referee John McCarthy to halt the bout at the 50-second mark. The loss puts the record of Dempsey, a late replacement for the injured Jared Cannonier, at 11-3. 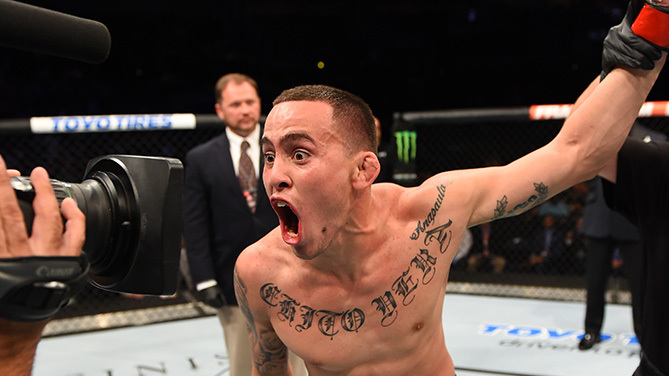 Ecuadorian bantamweight prospect Marlon Vera earned his first UFC victory, submitting Arizona’s Roman Salazar in the second round. Salazar (9-4, 1 NC) had some good success on the mat in the opening round, but Vera, an Ultimate Fighter Latin America alumnus, was clearly the better striker when the two were standing, making it a compelling clash of styles. 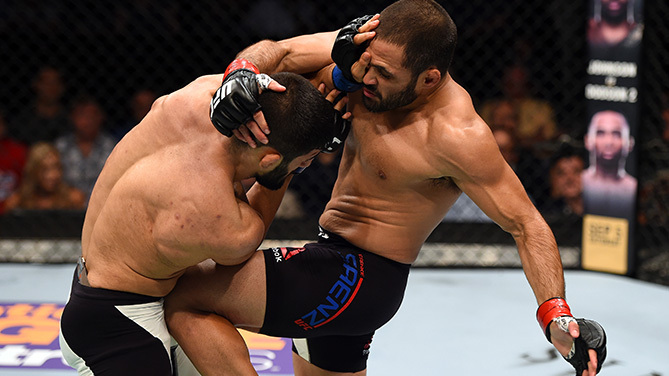 At least that’s what it looked like in the first five minutes, but in the second, Salazar’s apparent safe place on the ground turned to be his undoing, as Vera fired off elbows and sunk in a triangle armbar that ended the bout at the 2:15 mark. 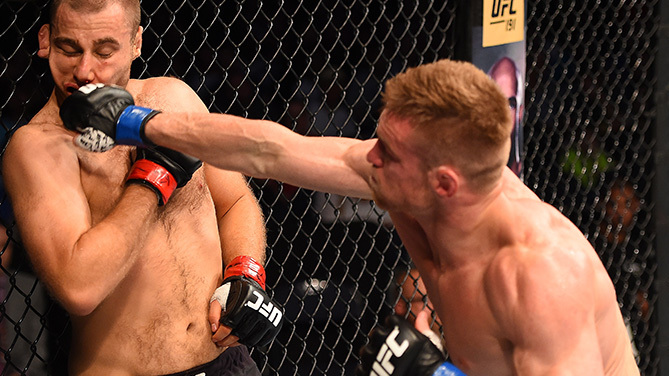 Unbeaten Octagon newcomer Scott Holtzman got the Tennessee fans involved immediately, with the Knoxville native finishing off an outclassed Anthony Christodoulou via submission in the final round of their lightweight bout. “It was an absolute dream,” Holtzman said. “The crowd deserved that one, not me. They traveled hours and hours to see me fight in the back hills of Tennessee in rodeo barns. This one was for them. I didn’t feel any added pressure being the favorite or making my debut in front of my home state fans, I put enough pressure on myself. Showing heart and a granite chin but little else, Christodoulou was on the receiving end of Holtzman’s wide variety of strikes from the start, with the question quickly becoming not if the Tennessee native would win, but what he would win with. The Athens, Greece product did show signs of life briefly with his ground game late in round two, but there was nothing that seriously threatened Holtzman, and it was “Hot Sauce” who finally ended matters with a rear naked choke at 2:40 of the third round. With the win, Holtzman improves to 8-0; Christodoulou falls to 12-6.